Vinpocetine is a derivative of Vincamine, naturally occurring in Crioceras longiflorus. Clinical studies suggest that Vinpocetine facilitates cerebral metabolism by improving cerebral blood flow, increasing glucose and oxygen utilization by neurons and concentration of neurotransmitters involved in the process of memory formation. Clinical studies have also shown that Vinpocetine may help to maintain healthy microcirculation in the inner vital organs of ears and eyes. Research has shown that the effects of this compound go beyond mere prevention and turn vinpocetine into a Powerful Memory Enhancer. Vasodilatory action measured by an inhibition of the phosphodiesterase activity and increase in the levels of AmpC, with an increase of the blood flow by diminishing the vascular resistance. Improvement of the hemorheological conditions in the microcirculation upon increasing the deformability of the erythrocytes. Brain cells' increased tolerance to hypoxia (lack of oxygen in the brain) and/or ischemia (permanent or transitory decrease of blood flow). Increase in the levels of oxygen and use of glucose in the neurons. Improvement in terms of production of neurotransmitters such as dopamine and noradrenaline, to which its nootropic effect has been attributed. 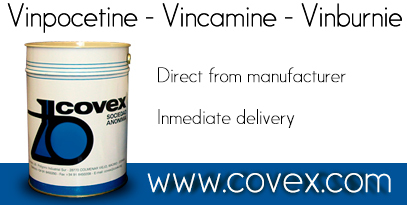 Vinpocetine Covex 5mg is absorbed rapidly when administered orally, reaching maximum concentration in 1.5 hours. Its bioavailability is very variable, oscillating between 7-57%, and increasing with the simultaneous ingestion of food. The volume of distribution is approximately 3 l/Kg in young adults and superior values have been described in the elderly (approximately 7 l/Kg). Vinpocetine Covex 5mg is extensively metabolized in the liver, with the apovincaminic acid (AVA) being the principal resulting metabolite, apparently destitute of pharmacological activity.